The BBC's Jim Muir, in Tehran, says the president had taken an "unusual step". Iran's Supreme Leader Ayatollah Khamenei has ruled that the poll must proceed on time. Our correspondent says that for Mr Khatami to challenge that would have been to question the foundations of the Islamic republic so he is trying to make the best of a bad job and to persuade the people to vote. Observers say there is little sign of public interest in the elections. The poll suffered a new blow on Saturday with the withdrawal of a further 550 candidates who had been qualified to stand. A government survey predicts a turnout of about 30% nationwide. 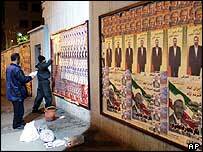 Some experts believe that in the big cities - especially the capital Tehran - turnout could drop as low as 10%. Some 80 sitting MPs, including some of Iran's best known politicians, were among the candidates barred by the Council of Guardians. "There is no public debate"